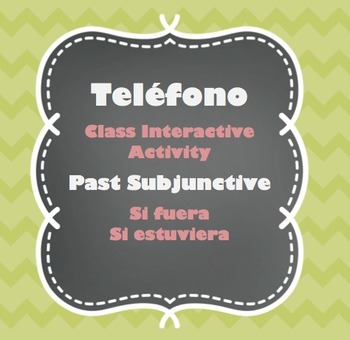 “Teléfono” is an interactive activity that mimics the game “telephone”, but it is written instead of verbal! 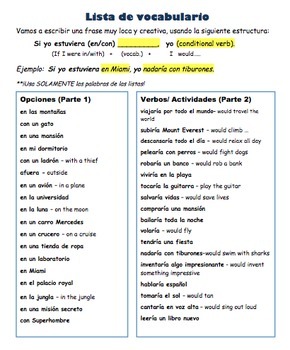 This file includes two options to get in many repetitions of the past subjunctive structures "Si fuera ___, yo ___(conditional verb)", OR "Si estuviera (en/con), yo ___ (conditional verb)". 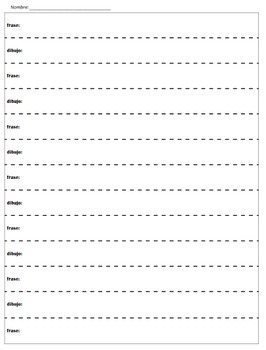 Students will create sentences given this format from a pre-made vocabulary list, and pass their papers throughout the class. Each time the paper is passed, the next student either draws the sentence written, or writes a sentence for the drawing. The goal is to see if sentences change by the end, or end up the same, as in the real "telephone" game! 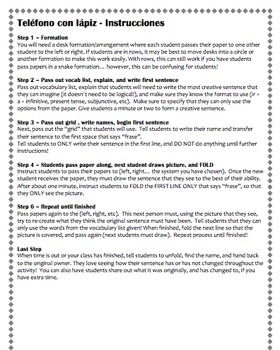 Each time the paper is passed, students keep folding the previous line so that they can only see one section at a time, which is how the sentences possibly change. Students love this activity and it is an easy way to get in repetitions of any structure!